Elche (Elx)- the third most populous city of the Valencian Region. Elche encompasses the entire range of attractions that the province has to offer its visitors: pre-history, history, natural riches, beaches and the influence of its citizens on culture and traditions are all elements that are worthy of note in this modern, thriving and growing city. The Hotel Elche is a modern property with a gleaming white façade, located within two kilometres of the Palmeral and the city centre. Guests can energise themselves with a workout in the nearby fitness centre, and enjoy relaxation time in the sauna. 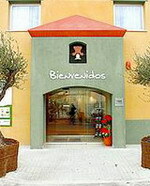 The hotel restaurant serves traditional regional dishes along with a selection of Spanish wines in a stylish setting, and guests can round off the day with a cocktail in the modern bar. Those on business can use the three meeting rooms with audio- visual facilities and wireless Internet access. Guests arriving by car will find garage parking onsite (for a fee), and practical amenities include 24-hour room service and front desk with safe-deposit box. Alicante Airport is 15 kilometres away. The 63 contemporary guestrooms are finished with crisp white linen and sleek wood headboards and furniture. 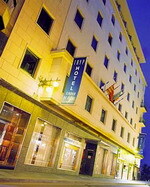 The Hotel Campanile Elche is located in Elche, Spain. It is two kilometres from the Basilica of Saint Mary and Arab Baths, and three kilometres from the Palm Groves. 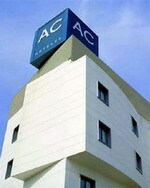 Alicante city centre is located 20 kilometres away. This modern hotel features a fireplace in its lobby, and offers laundry facilities (surcharge) and a 24-hour front desk. The Hotel Campanile Elche offers complimentary breakfast and the restaurant serves seasonal dishes, hors d'oeuvres and daily specials. Golfing, tennis, water skiing and fishing are available nearby. The 77 guestrooms all have coffee/tea makers, complimentary bottled water, cable TV and air-conditioning. The beautiful 4 star Jardin Milenio is a member of the First Class Collection of hotels. The hotel was opened in the year 2000. It is ideally located, just five minutes from the commercial and urban setting, but in natural surroundings. It offers an unbeatable panoramic view of Elche's palm groves. Locals describe Alicante as "la millor terra del mond" (best place in the world), and while that is a bit of an exaggeration, it is a living city, thoroughly Spanish. There are good beaches nearby, too, a lively nightlife in season and plenty of inexpensive places to shop and to eat. The Milenio Hotel HAS a new restaurant “La Taula", a place where the Mediterranean gastronomy and exquisite local cuisine will take the lead. A menu with proposals gathering deeply rooted aromas, essences, flavours and ingredients from the region. A very well stocked wine cellar consisting of high quality wines from different protected designations of origin. Tryp Ciudad de Elche is located in the centre of Elche, Alicante, Spain, 100 metres from Glorieta Plaza and 200 metres from Ayuntamiento Square. 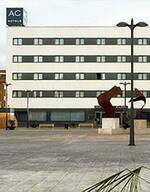 Elche Parque Renfe Station is 500 metres away and Alicante city centre is 20 kilometres away. The reception area of Tryp Ciudad De Elche features polished floors, a cherry wood reception desk, and potted palm trees. Wireless Internet access is available throughout the hotel's air-conditioned public areas, complimentary newspapers are provided in the lobby. Multilingual staff run the 24-hour front desk. Parking is available nearby for a surcharge. A breakfast buffet is served each morning for a surcharge, and the lobby bar serves alcoholic beverages and soft drinks. Elda - famous for its footwear industry, in particular for women's shoes. Tourist sites include the Footwear Museum, the Archaeological Museum, the Torre del Homenaje del castillo (a tower dating from the 12th century), Castelar Square, Count of Coloma Palace, the Town Hall and the church of Santa Ana. It also celebrates the important festival of Moros y Cristianos. The AC Elda is a newly constructed four-storey hotel located in the centre of Elda, known for its shoe industry, 35 kilometres from Alicante. Visitors can find restaurants and bars around the hotel, or enjoy a stroll through the gardens and squares to the main Plaza Major, 300 metres away. Further afield the bustling town of Alicante is 35 kilometres away, known for its historic old quarter, beaches, and energetic nightlife. The hotel's restaurant, La Sabata offers guests typical regional and international cuisine in a relaxed informal atmosphere. After sampling some of the traditional tapas dishes, guests can burn off some calories at the fitness centre, or relax with a Turkish bath or sauna. Business guests can make use of the hotel's conference rooms and exhibit space, and parking is available onsite. The 90 air conditioned guestrooms have a modern décor and are all equipped with cable television, direct-dial telephones, complimentary newspapers and high speed Internet access. Jávea - lies about 80 km north east of Alicante, in between Denia and Altea. Javea, between Denia in the north and the cabo de nao in the south, is embedded between two bays - the cabo San Antonio and the cabo San Martin. In the old part of Javea there are still some traditionally built houses with balconies remaining. Especially along the Avenida del Mediterraneo which runs along the Javea harbor area, you will find many restaurants and bars. From a sightseeing point of view, you should visit the church Iglesia de San Bartolome, which was built in the 12th century. Also of interest is the museum Soler Blasco, which can be found in the calle Primicias. The El Rodat Hotel is located in Javea, Spain, eight kilometres away from the Montgo Nature Reserve and 35 kilometres from Tierra Mitica theme park. 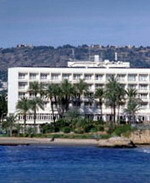 Javea Port is situated three kilometres away from the hotel. Wireless Internet is offered in the public areas. This hotel has an outdoor pool, a children's pool, and a heated indoor pool. There are two tennis courts in the hotel gardens and parking is complimentary. There are six cabins which contain relaxation and treatment rooms and include a solarium, sauna, bithermal showers, and steam room. The multilingual staff at the 24-hour front desk can offer translation services and currency exchange services. 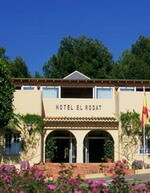 El Rodat Hotel serves international dishes in the El Rodat Restaurant. The hotel also provides 24-hour room service. Breakfast is also available at a surcharge. Orihuela - historic town, lying between Alicante and Murcia, on the banks of the River Segura, famous for its market gardens and splendid baroque cathedral. Within 20 kms of Orihuela is a stretch of coastline studded with small bays, and home to three championship courses - Campoamor, Las Ramblas and Villamartin. The Hotel Servigroup La Zenia is located in Playa De Orihuela, Spain, opposite Dehesa de Campoamor and La Zenia beaches, and within 7.5 kilometres of the Aquopolis theme park. The hotel's outdoor pool offers views of the ocean, and is surrounded by palm trees, deck chairs, and sun umbrellas. Wireless Internet access is available in the air-conditioned public areas (surcharge), and audio-visual equipment is available. Guests have access to massage and beauty services. Hotel Servigroup La Zenia's half-board rate includes a buffet breakfast, and either lunch or dinner. The full-board rate includes breakfast, lunch, and dinner. The hotel has an onsite restaurant, and room service is provided around the clock. Rojales - a town close to the natural park of La Mata and to Torrevieja. Surrounded by many fields of flowers, vegetables and fruit trees in the countryside, yet close to a beach bordering a lovely lagoon. The town offers an array of sporting facilities including football, volleyball, tennis, basketball and swimming, plus golf. Hotel La Laguna Spa and Golf is located eight kilometres from Rojales, Spain. The hotel is four kilometres from the beaches of Guardamar del Segura on the Costa Blanca and 40 kilometres from the city of Alicante. 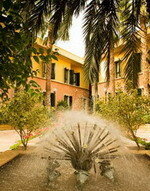 It is set in gardens with palm trees and there is an outdoor swimming pool and children's pool. The hotel's spa offers massage, treatments, jetted tub, sauna and steam room. There is a hair salon where beauty treatments are available. The hotel also has a gym with fitness equipment. For the golfer there is an 18 hole course located at the hotel and many other fantastic course within 15 mins of the front door. Restaurant La Laguna serves Mediterranean specialities in a contemporary setting. Grill La Laguna serves barbecued dishes in the gardens during the summer months. A complimentary buffet breakfast is provided daily. Villajoyosa - a fishing village on the Mediterranean sea. It is the historic and administrative capital of the comarca of La Marina Baixa and is located 32 km from the city of Alicante, in the coastal area known as Costa Blanca (White Coast). Villajoyosa, whose name literally means Joyful Village, has over three kilometers of beaches, including La Playa de la Vila, close to the city centre. The river Amadorio runs through Villajoyosa. The area is famous for its chocolate industry and tourism. One of the most popular tourist attractions is its Gothic Catholic church, with a Baroque altar piece. It is also important for its festival of Moros y Cristianos, declared an International Tourist Interest Festival. Perched on a seaside cliff and flanked by two beaches, the Hotel Montiboli is an oasis-like Arabian-style hotel surrounded by lush gardens and set two kilometres from downtown Villajoyosa. El Paradis Beach is set 1 kilometre from the hotel and offers windsurfing. On hot days guests can sunbathe and cool off in the hotel's two sparkling outdoor swimming pools, which are set on dramatic cliff tops with sweeping sea views. A heated pool is housed in a naturally lit structure with stone walls, and connected to the hotel's spa area, which offers a gym for active guests, a sauna, steam baths and spa tub. Guests can also make use of a tanning bed, have their hair styled at the hotel hair salon and indulge in the various massage and beauty treatments offered in the spa. The cliff on which the hotel is perched is flanked by two beaches: one has a beach bar, towel and umbrella service and the other is a nudist beach. Sea views accompany meals in the El Emperador Restaurant, which uses fresh produce from the hotel's own farm, and the Restaurant Minarete is set on the seafront and specialises in local seafood dishes. Places To Visit In Javea by Nigel A. 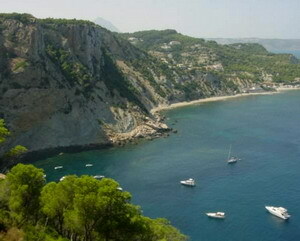 If you haven't given any thought about your next vacation destination you should take Javea into consideration. Besides the great beaches and the almost perfect weather conditions, Javea has other things to offer that should be taken into consideration by all tourist that visit this small town in Spain. Take for example the Safari Park Vergel where visitors can discover the delights of the Animal Kingdom in a fun-packed environment consisting of 35 hectares of land that are the home to approximately 1400 animals and about 145 different species. Visitors have the possibility to go round the park using the car and have the option of three routes to see African lions, Bengal tigers and herbivores. You can also walk around the open sections which are cleverly split by theme: African birds, oceanic fauna, Iberian fauna, large herbivores and more. If you are into nightlife, Javea is the place to be - more specific, the Achill Nightclub. The disco atmosphere here is at its best; hits from the 70s, 80s and 90s are played, creating a great atmosphere. Seating is abundant inside, and for a change of scenery with less noise the outside patio in the summer is the perfect spot for a chat and that amazing view. Here you will find a great mix of DJs from all of Costa Blanca. Generally speaking, the music you will hear here is a combination of dance, techno and house (depending on the DJ and the night). More than that, at certain times during the year, they hold party nights like 70s disco nights or R&B nights. Moving on, Javea also has Crazy Daisy's which is a terrific smallish bar located between Scallops and Nanyos on the Arenal. The drinks here are extremely reasonable and they have a big projector installed where they show all sorts of sporting events for fans. Here you will find a friendly atmosphere and the bar staff make you feel just like you were home. If you are into bowling, you might want to check Ozone bowling for a pleasant evening. A much advertised local attraction on the Costa Blanca is Mundomar in Benidrom, a great park. Once you will get into the park, you will spot the colorful parrots, the flamencos and the sea lions. Next, you will notice the bats that are all behind a thick glass screen in a very dark room but you will spot them without any difficulties. Besides the above mentioned, you will see monkeys, limas, dolphins as well as other animals. During this period, visitors have the possibility to go to the Artisan Fair in Javea Old Town which is the traditional Easter Fair. The stalls here have a wide variety of tasty goods including traditional cheeses and salamis, Moroccan sweets. Other things you will find here: herbs & spices, ceramics, candles and various artworks. It is a delight of color and a rather unique atmosphere. The local surrounding bars will be open to provide food and refreshments for all. All in all, Javea is becoming more and more popular for obvious reasons as it has plenty of sightseeing possibilities as well as great accommodation conditions thanks to the boom of the real estate market. Summary: The article briefly reviews some of the best attractions a tourist can find in Javea. About the Author - Nigel A. currently directs www.javeapropertyfinder.com, a website that offers details about Javea villa rental.